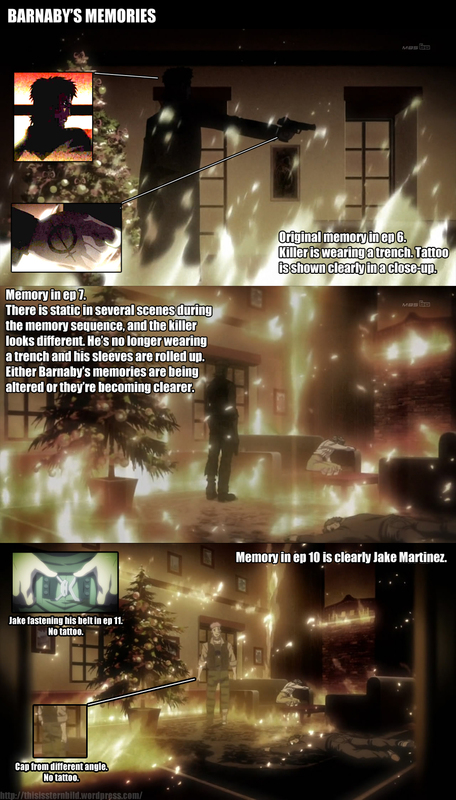 More facts that speak for the killer not being Jake: he doesn’t seem to remember the whole thing. He’d be just the type to use stuff like that to taunt his opponent, yet he completely misses the opportunity. They make a Very Big Deal with camera angles to not show the backs of Jake’s hands while he’s in prison, we only get a shot of them when he fastens his belt. And then he puts on the fingerless gloves and wears them all the way until the end. The “outrageous!tier” theory: We now know Barnaby was a NEXT already when he was two, and he mentions in the interview in episode 15 that just like baby Sam, his power would activate when he started crying. What if when he saw his parents die he activated his Hundred Power and killed the murderer of his parents in a fit of rage and sorrow? A child isn’t very strong, but a child with hundred times the physical abilities would still be able to do severe damage to an adult. Something like that would be a big trauma, so Barnaby might have blocked it out from his memory and Maverick could very well have covered up the evidence for whatever reason. And the whole thing with altered memories and the charade with Jake was just another way to give closure to Barnaby. But letting Jake out of prison so easily still doesn’t make sense. If the whole thing was just Maverick’s plot to help Barnaby move on, why of all possible criminals would he have picked Jake? Why go through all that trouble for Barnaby? Why were Barnaby’s parents murdered in the first place? Everything seems to go back to Maverick. If he turns out to be a good guy in the end we’re gonna feel so trolled I don’t even. Since Barnaby recalled the shape of the parent’s murder,looking at Kotetsu that was emerging from the flames, is it possible that Tiger’s brother could be the real murder? I’m not buying that theory because of the tattoo. Kotetsu would know if his brother had a tattoo like that, unless they’ve been out of touch for over 20 years. Also, the memory was sparked more due to the pose, not exact resemblance. I know this is silly, but maybe it was an android? I don’t think it was an android. It was 20 years ago, so something like that didn’t exist back then. Cis was state of the art in episode 15. The flames covering the killer’s face seem to be just a way to show that Barnaby doesn’t remember what he looked like. If you mean the scrolling text at the end, it’s a fan created series timeline based on the facts we know so far.